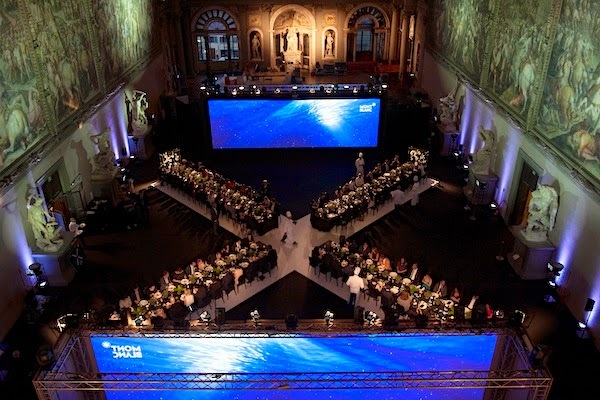 Montblanc hosted an exclusive dinner on 9 July 2014 at the historic Palazzo Vecchio in Florence for the launch of their new Montblanc Extreme leather goods collection. Hugh Jackman, who currently fronts the Montblanc advertising campaign, was in attendance, pictured above with Montblanc International CEO Jérôme Lambert. Mr Lambert wore the Montblanc Meisterstück Heritage Perpetual Calendar timepiece, quite possibly my favourite from their new collection this year. More details on the watch below. I attended the launch event in Florence, and I can tell you that Hugh Jackman was very smiley all night. Yes, I was in the same room as Hugh Jackman and managed to compose myself and not do anything too fanboy-like. Hugh Jackman shaved his head and grew the thick black beard and moustache as he is currently filming Pan, an upcoming 2015 fantasy film about the origin of Peter Pan, directed by Joe Wright. His new Extreme look (I am very on point here) as Blackbeard in the movie is a huge departure from Wolverine, or the very dapper guy we see in the current Montblanc advertising campaign. So radically different, word was that when he arrived at the uber grand venue, front house staff did not recognise him. "What's your name and which country please?" Is it possible to not fall in love with this man any further? That quick wit and sense of humour. Dressed in a classic black suit with a grey shirt and matching silk tie, he commandeered a great presence in the room. A vibe perhaps not too dissimilar to the stunning paintings found within the Salone dei Cinquecento, the most impressive chamber within the palace where the dinner was held. On the walls of the Salone dei Cinquecento within Palazzo Vecchio are large and expansive frescoes that depict battles and military victories by Florence. If being in the presence of Blackbeard is not magical enough, the great Leonardo da Vinci once painted one of the walls in that same room in the 1500s. The imposing and victorious murals were the perfect backdrop for Montblanc's launch of their new high-performance and tough wearing Extreme leather, which boasts of glorious attributes including abrasion resistance, water repellence and heat resistance. The collection includes various bags and small accessories, scheduled to be in stores from September 2014. We will look at some of the pieces closer to the launch date. We dined in a X formation in the middle of the gorgeous chamber within the illustrious palace built in the 13th century. X for their new Extreme range or because we were in the presence of one of the X-Men? The table settings at the collection launch dinner, and each row paid homage to famous Italian painters, including Alessandro Allori, an Italian portrait painter of the late Mannerist Florentine school. A craftsman was also on site to demonstrate some of the unique characteristics of their new Extreme leather collection. Florence was chosen as the launch location as all the pieces from the collection are made at their manufacturing facility there. The Tuscan region has long been considered the epicentre of leather goods making, with a strong concentration of tanners and generations of leather craftsmen residing in the region. 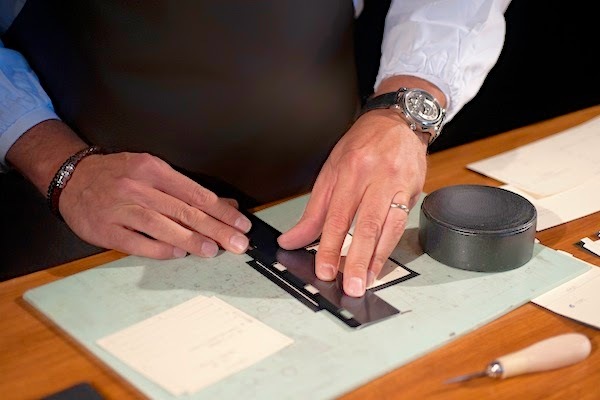 Montblanc is certainly in good company as Gucci and Salvatore Ferragamo amongst several others, produce their leather goods in Florence, which bear the fine tradition for leather. We also visited Montblanc's leather goods factory in Florence to gain a better behind the scenes look, more on that later. To round things up, here is a look at What's He Wearing. On the left is one very dapper Jim Shi from New York, certainly the man around town. Jim Shi wore a dark grey Ralph Lauren Purple Label suit, over a striped shirt with contrast collar and matching knitted tie from Ralph Lauren Black Label. Jim accessorised with a pocket square from Mark McNairy which revealed a very rude message which shall remain unmentioned, and patent leather shoes with spiked edges from Christian Louboutin. On the right is Yours Truly, in a blue cotton blazer from J.Lindeberg, white Mandarin collared shirt from Zara and navy trousers from Topman which were perhaps a little too tight from one too many gelatos. I accessorised with a navy Salvatore Ferragamo belt (when in Florence...), black velvet slippers with golden embroidered dragonflies from Alexander McQueen, and a pocket square from Amazon Fashion London², which I previously also featured on Luke Evans and George Craig. Jim is probably going to kill me for posting the above picture, as he said it wasn't flattering and began to nitpick a list of imaginary flaws. I think we bond over the mutual insecurities of ourselves. I started the blog in 2008, and this is the second time I posted a picture of myself. I cannot answer for Jim, but I don't really like my picture taken as I often think I look terrible in them. We are only human to suffer from imperfections, and sadly my glass is often half empty. Someone once said that if I cannot learn to love myself, I cannot expect to meet anyone who will accept me for who I am. Taking baby steps to make my glass half full, it does not matter how slow the pace is, the important thing is we do not stop. So Dearest Jim if you are reading this, which I doubt: can we please agree that we both look great in that picture? I might have gone Extremely out of point with the above paragraph, but still Extreme. Here is a close-up of our watches: To the left, Jim Shi wore a Montblanc Meisterstück Heritage Perpetual Calendar timepiece, also previously featured on Hugh Jackman (see features here). On the right, I wore the Montblanc Star Classique, also previously featured on Pierre Niney. The Montblanc Extreme leather goods collection will launch around September 2014.
fill up my glass with champers darlink! the dinner was beautiful. so surreal. we all love hugh jackman! i'll post more pictures of him.